The Original JAMB admission letter is a very important document candidate(s) should have, as long that such candidate(s) has been admitted in any Institution. How does the original JAMB admission Letter looks like? The Original JAMB admission letter is a document indicates and prove that a candidate has been offered an admission into an institution. 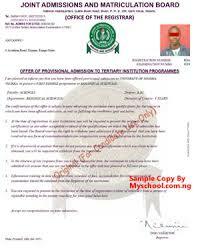 Candidate do not need to go to JAMB office to get this document because its available online. We advice Candidates not to wait till the institution needs a copy of this document before they go for it. Because all institution admitting any student must request for the “Original admission letter form JAMB” So why the waiting? After payment, the candidate should send via sms: Full Name, Exam year, JAMB Reg. Number Email address and Teller Number to 08032934651. The document will be sent to the Candidates E-mail address after 30minutes of payment. Note – The Email address must be valid and while printing the Original JAMB Admission Letter, it should be done with a colour printer. Share this information to others that has not gotten the Original JAMB Admission Letter.